Stung by the pioneering space successes of the Soviet Union - in particular, Gagarin being the first man in space, the United States gathered the best of its engineers and set itself the goal of reaching the Moon within a decade. 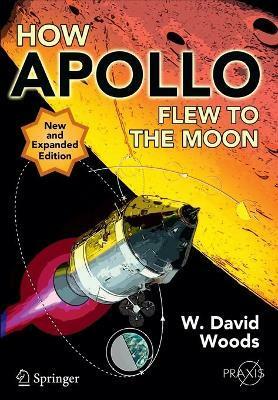 In an expanding 2nd edition of How Apollo Flew to the Moon, David Woods tells the exciting story of how the resulting Apollo flights were conducted by following a virtual flight to the Moon and its exploration of the surface. From launch to splashdown, he hitches a ride in the incredible spaceships that took men to another world, exploring each step of the journey and detailing the enormous range of disciplines, techniques, and procedures the Apollo crews had to master. While describing the tremendous technological accomplishment involved, he adds the human dimension by calling on the testimony of the people who were there at the time. He provides a wealth of fascinating and accessible material: the role of the powerful Saturn V, the reasoning behind trajectories, the day-to-day concerns of human and spacecraft health between two worlds, the exploration of the lunar surface and the sheer daring involved in traveling to the Moon and the mid-twentieth century. Given the tremendous success of the original edition of How Apollo Flew to the Moon, the second edition will have a new chapter on surface activities, inspired by reader's comment on Amazon.com. There will also be additional detail in the existing chapters to incorporate all the feedback from the original edition, and will include larger illustrations. Illustrations note 127 Illustrations, color; 128 Illustrations, black and white; XXXI, 555 p. 255 illus., 127 illus. in color. - more technical explanations and anecdotes. From launch to splashdown, hitch a ride in the incredible Apollo spaceships, the most sophisticated machines of their time. Explore each step of the journey and glimpse the enormous range of disciplines, techniques, and procedures the Apollo crews had to master. Although the tremendous technological accomplishments are well documented, the human dimension is not forgotten, and the book calls on the testimony of the people who were there at the time. A wealth of fascinating and accessible material is provided, including: the role of the powerful Saturn V; the reasoning behind trajectories; the day-to-day concerns of human and spacecraft health; the triumphs and difficulties of working in an unforgiving and hostile environment while surrounded by hard vacuum and pernicious dust; and the sheer daring that was involved in traveling to the Moon in the mid-20th century. Illustrations.- Author's Preface.- Acknowledgements.- Foreword.- Chapter 1: Apollo - an extraordinary adventure.- Chapter 2: The Apollo Flights - a brief history.- Chapter 3: Launch - a fiery departure.- Chapter 4: Earth orbit and TLI.- Chapter 5: Retrieving the lander.- Chapter 6: Navigating to the Moon.- Chapter 7: Coasting to the Moon.- Chapter 8: Entering lunar orbit - the LOI manoeuvre.- Chapter 9: Preparation for landing.- Chapter 10: Next stop - the Moon.- Chapter 11: Down in the dust.- Chapter 12: Exploration at its greatest.- Chapter 13: Rendezvous and docking.- Chapter 14: Heading for home.- Chapter 15: Re-entry.- Epilogue.- Glossary.- Appendix 1: Computer programs.- Appendix 2: Mission data.- Further reading.- Index. In his spare time, W. David Woods, took up studying the Apollo program and contributing to its documentation on the web. In 1994, he began scanning NASA history books under the aegis of the NASA History Division for presentation on the web. In 1997, David was presented with a Public Service Award in Washington D.C. by the NASA Administrator. In 1998, David began publishing the Apollo Flight Journal online, hosted by NASA. again under the aegis of the NASA History Division. This project is a companion to the highly regarded Apollo Lunar Surface Journal and both are considered canonical references about the Apollo missions. An AFJ consists of a core transcript of a mission. This is carefully corrected, commentary is added and is used as a structure upon which many multimedia types relevant to the mission can be hung. This includes audio, video, and photography from NASA's archives. The knowledge and experience gained while researching and writing for the AFJ led to the publication in 2008 of "How Apollo Flew to the Moon." This book has been very well received and reviewed. Many commentators place it within the top few books about the Apollo flights.